I think Randy collects mint or very close to it, marbles . And I do have to ask how is polishing, conserving something that would not get in any worse condition if just left alone? But..what if it is NOT left alone ? I mean..Aliens attack, crap gets blown up and the marble gets chipped ! BUT, If already nice and new looking, it can suffer those alien barrages !! Galen, Galen oh Galen - if it looks like crap leaving it alone will allow it to stay looking like crap - you should know that! Go back and look at what I did with some of those swirls Galen - they certainly don't look like crap now! Remember, try not to hover over what the $$$$$$$ values are, TRY to keep the ART of the glass first and foremost in your mind. Rich, you need to be a little less defensive and read a little closer. I understand polishing or torching a beat to crap marble. I do not understand using the term conserving. And it is also not restoration as they are not put back to an original state. I would see it as restoration. If you replace paper in a book or treat a decaying painting, you are restoring. Those processes of restoration ADD something to the item, but it is still restoration. When you restore furniture...and god knows I wish my wife did not, you take away wood,pain,stain and usually add hardware and paint. You ADD to it and restore it. I like the word "moot!" I am not defensive Galen - it is YOU that is avoiding the ART of repairing old marbles as yet I have not read anything you post about this subject - only the obsession of a marble's $ value. I await your post eagerly about art. You have obviously only retained what you wanted ton from my postings. Sorry Rich there is no Art to polishing a marble. There is some art to what you do when you do your torch repairs. And you do do it very very well. It is just some of the terminology that gets to me. And the sleazy scumbags that pass off worked on marbles as original surfaces. And the polishers that do not care where or what happens to the marbles they polish. Your torched marbles do not bother me in the least as they are very easy to tell from original. And Rich you are making a huge assumption that I do anything just because of $$$$ And I find that a bit insulting. I collect marbles for their beauty. 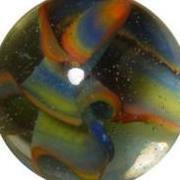 I find vintage mint original marbles much more beautiful than polished or torched marbles. I have a large amount of Art glass marbles, purchased for their beauty. I do not by the marbles I plan on keeping as an investment. I think that would be foolish. Who said anything about p[olishing? I am referring to the swirls i TORCH Galen - how about the ART in that - go on, tell me! Also, YOU always worry about a repaired marble's money value and in several of your posts, refer to the LOWER value of the repaired marble! Insulting - no, just fact - go back and count your posts about the $. I'll await your post about the art I do with my torching in taking a piece of "junk" and make it "beautiful" (I am told by the owner) - thanks. Also, I agree with you about the investment issue with marbles. Conservation discussion split from this thread, http://marbleconnection.com/topic/18389-wanted-to-buy-handmades/, in the buy-sell-trade forum. I did this same thing in another forum/thread earlier. agree with the people who don't agree with him. Well, at least recently. I know it will IF we all keep the discussions professional and stay to the questions asked and not answer them by posting thing that have nothing to do with the question. I keep asking about the ART of the crappy swirls that I clean-up rather than the value of the new work verses what it was worth before I torched it. I am with the side that values the person's feelings about the marble now that it looks 100% better than it did before I reworked it. I put more integrity into NOT trying to reproduce the original marble's look as the maker intended but rather into the new look without all the damage. Trying to copy another's work is something I choose not to do but I sure love to repair damaged marbles and give them a better look than they came tome IF the old glass will allow it. And the sleazy scumbags that pass off worked on marbles as original surfaces. And the polishers that do not care where or what happens to the marbles they polish. I can see both of those sides very easily. Get off the defensive kick Galen - stay on point! Speak more about the ART please. The point is I do not consider polishing marbles artistic. And I believe there is much more skill than art involved in reheating and getting the dings out of a marble. Making one from scratch that looks attractive and has great Eye appeal involves artistic abilities. Just making a marble or reheating and removing blemishes does not necessarily involve artistic abilities. Skill, yes. Just like I do not consider someone that restores a vehicle an artist I can not deny he has skills if he does a good job. Just my thoughts since you wanted them. And this thread was not about whether fixing marbles takes an Artist or not. Your point is not necessarily "The" point. "The" point was whether fixing marbles is restoring them, And I do not believe it is, as the can not be returned to original condition. Just like polishing a coin is in no way "Restoring it"
Aw jeeze, I really hate to do this, but I have to agree with Galen here regarding the term "restoration." A classic car can be "restored" if you are able to get the correct period replacement parts -- a 1955 Chevy BelAir fender for your 1955 BelAir, for example (although I'm not sure how car restorers feel about the repaint, which would have to involve new paint even if the paint was made to the same formula as the original.) But I don't think you can do the same for a marble. I think I'd be more inclined to consider using another word that was brought up recently -- conservation. I worked fairly closely with some conservation people for a long while (both object and painting conservation), and thinking of some of the things I saw them do I think the word might be appropriate. Let me think about it and see if I can remember a good example or 2 that might be similar . . .
Buffing Polishing and Remelting or Torch worked are great words that describe what is actually done. Many years ago (more than I like to remember) I had to decide what to call the work that I do on hurt marbles. After much thought and research (asking peple what they thought I should call what I do to hurt marbles), I settled on "reconditioning" meaning that I was going to change the condition of the hurt marble. To me no artistic is involved. However there are two very important values that are a must. Numer one is skill (gained through experience) and number two patience (lots of it) along with one hundred percent honesty. I do have a some sellers that I refuse to do marbles for because they have listed marbles as orginal when they have been reconditioned. I'm sure some have gotten by me as I don't look at listing very often anymore. The other id that I use is my email address which is: marblemender@neb.rr.com. ----Leroy---- This is my opinion and mine alone. I think you've hit on it. "Reconditioning" does very nicely, on several levels. I believe I''ll try to use that word from now on. You continually refuse to directly speak to the ART what i do specifically and pesrevrate on polishing. I would like to say directly that the specific ART what Rich does is, indeed, most pesrevrating. Bondo, remolded fiber glass and fabbed parts are how many are restored. It's splitting hairs on this topic as it applies to actual personal preference to the topic rather than something written in stone. 1. the act of restoring. 2. the state of being restored. 3. a return of something to an original or unimpaired condition. 4. restitution of something taken away or lost. 5. something restored, as by renovating. 6. a reconstruction or reproduction, as of an extinct form, showing it in the original state. a. the work or process of replacing or restoring teeth or parts of teeth. b. something that restores or replaces teeth, as a denture or filling. You don't restore teeth with other people's teeth :0) You don;t restore houses with the same wood most of the time and you don;t restore furniture in the same fashion....semantics and personal preference,period. I wonder,is it possible that an experienced marble collector can not tell if a machien made marble is polished? Let me rephrase this,is it always clear to see the difference between a polished and unpolished machien made marble? ?Just curious. I had a guy tell me 10 vitro helmets I had sold him were polished....which seemed off the wall. I asked him how he could tell, he said they were "too clean"
I know there are a lot of tell-tale signs and I know there are a lot of assumptions based on scratches as well, so I can say...I have no idea nor am I worried about it If I list a marble and there is a concern, I ask galen,Leroy and Clyde and base it on the consensus of those 3. Nothing else to be done I suppose. I wonder how a seasoned vintage marble collector would feel (you know to whom I refer) IF they were able to find a highly sought after marble of old that was NEVER played with - put into a cotton lined box and sealed away from heat, dust and the elements.